The Automatic Khakhra Roasting Machine is an energy-efficient and robust product that promises evenly-roasted khakhras. 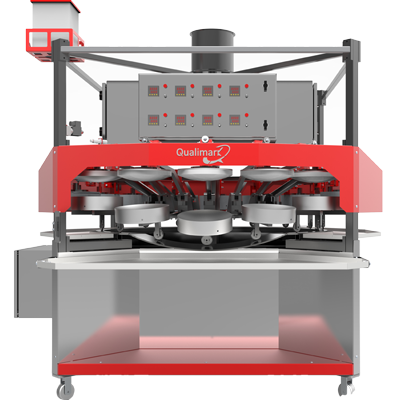 Owing to a lean and compact design compared to other machines, automatic khakhra roasting machine occupies very less floor space. The machine is equipped with advanced automation functions and VFD machine control. The automatic machine minimizes the requirement of operator’s interference and promises well-roasted khakhra as per requirement. With drop-down roasting dish design, the machine is very easy to operate and promises smoother function and efficient production operations. The dish hinge is designed in-house and is made from sturdy and robust materials with less number of moving parts, promising minimum maintenance requirement. 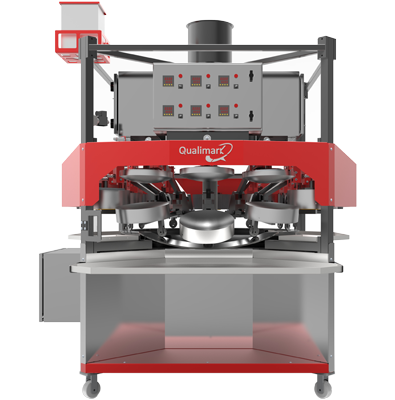 Qualimark’s automatic khakhra roasting machine is using patented and unique drop down dish design, different from other machines in the market. Other automatic Khakhra roasting machines use a top plate up side design where roasting dish is tied with a flexible and mobile M.S. cable that vibrates and jerks in air during the operations. The rotating and lifting mechanism is spread in many layers and has huge number of moving parts. This increases the diameter as well as the height of machine. Such a machine requires high maintenance and an operator cannot even ensure precise dish movement in such kind of machine. Qualimark’s machine comes with an in-house designed and developed bottom dish drop down mechanism. In this, instead of top dish, the bottom dish is movable, opens up and goes down. These set of top and bottom dish is tied and assembled with a heavy duty 20×20 mm precisely-blended iron bar. The design innovation gives the dish greater strength and eliminates the possibility of vibration or jerk during rotation or vertical movement of the dish. Also, the bottom dish drop down design reduces the size of machine by 30%. As there are 50% les layers in Qualimark’s machine, it is quite easy to operate and requires less maintenance than other machines. With a sturdy design and solid build quality, the machine is quite reliable and ensures streamlined operations for a long time. Also, such a design has one more advantage in terms of operations. Qualimark’s machine makes it easier for operator to collect and place Khakhra in machine as bottom dish is mobile and goes down instead of upper dish. This makes it easier for operator to move roasted khakhra with just the slide of a finger. With an easy-to-reach speed regulator in place, it is extremely easy for an operator to change the rotating speed of the machine. An operator is required to just turn one knob to change the speed unlike other machines where an operator has to stand up and go to main panel for changing the speed. This increases efficiency of operator ensuring minimal loss of production. As the feature is quite frequently used during operations, the rotating speed knob is placed near the operator. So, an operator just has to reach out to the knob to change the rotating speed according to the roasting time requirement of different khakhra flavours. 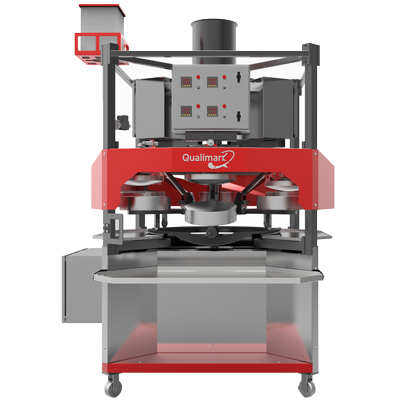 Qualimark machine is structurally superior than other khakhra making machine that use M.S. pipe fabricated roasting dish hinges. As these M.S. pipe fabricated roasting dish hinges are light in weight, they are poor in terms of strength and are not accurately machined. 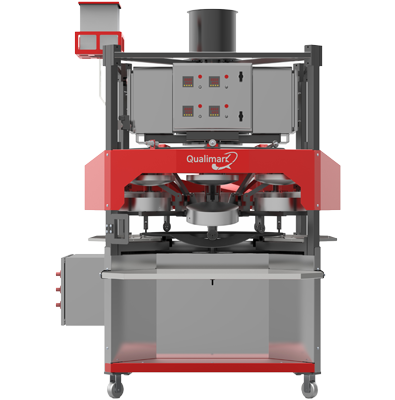 Qualimark understood the importance of this in Khakhra roasting machine and designed and developed a solid M.S. hinge, in-house. The hinge is made from 20×20 mm solid M.S. bar that is 10 times stronger and more accurate in dimension than conventional hinges. Tested for various conditions and situations, the solid hinge promises perfect, smooth and accurate movement every time.